Orange Fresno chile peppers grow on green leafy plants that can grow from 60 to 76 centimeters in height and can spread out up to 45 centimeters. The Orange Fresno chile peppers mature from green to orange on the plant, and grow upright. The mature orange pepper is conical in shape, tapering to a soft point, and is up to 7 centimeters long and 3 centimeters wide at the shoulders. Orange Fresno chile peppers have a thin skin that has a crisp and juicy texture. 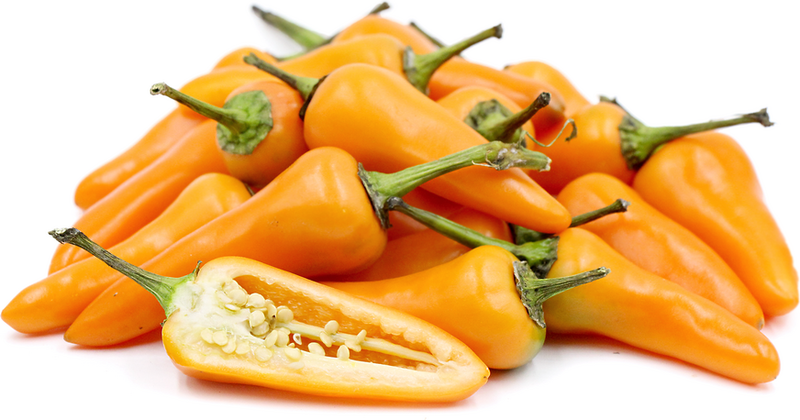 They have a slightly fruity, bell pepper taste, that gets spicier as the pepper matures to its ripe orange color. Orange Fresno chile peppers, like their red counterparts, are spicier than a jalapeno and rank between 2,500 and 10,000 on the Scoville Heat scale. Orange Fresno chile peppers are available in the fall through the spring months. Orange Fresno chile peppers are a small, mildly spicy variety of Capsicum annuum. Fresno peppers are most often thought of as either red or green, however, both orange and yellow varieties exist. Orange Fresno chile peppers are not widely known in the United States and are more commonly found in European markets. The orange pepper is hotter than a jalapeno. Orange Fresno chile peppers contain high amounts of beta-carotene, which gives the fruit its bright orange color. All chile peppers are a good source of vitamins A and C, providing twice the vitamin C of an orange. Orange Fresno chile peppers contain the compound capsaicin, which research shows has been beneficial (in extremely high amounts) in cancer treatment and prevention. Capsaicin is concentrated in the ribs and seeds of the pepper and is what gives the pepper its spicy punch. Capsaicin also offers anti-inflammatory and pain-relieving properties. Orange Fresno chile peppers can be cooked or served raw. Pureed peppers make a nice medium hot sauce. Dice Orange Fresno peppers and add to pizzas, pastas or salads. The orange pepper gives salsas a subtle kick. Immature green Orange Fresno chile peppers won’t be nearly as spicy as when they are mature, though they can be used in the same manner. Orange Fresno chile peppers can be pickled or sliced and used to infuse vinegar. Slice lengthwise and stuff them with ground meats, cheese and breadcrumbs. Because the Orange Fresno chile peppers have thin walls, they aren’t ideal for drying. Store Orange Fresno chile peppers in the refrigerator, loosely wrapped in plastic, for up to a week. Fresno chile peppers were first grown and developed in Fresno County, California on a small farm near Clovis owned by Clarence Brown Hamlin. Hamlin owned the Clarence Brown Seed Company and was self-taught when it came to developing new plant varieties. Hamlin, known as “Brownie” by his friends, passed away in the late 1950s. His nephew has now taken up his uncle’s work in growing and marketing the pepper. Casey Hamlin grown Fresno chile peppers from heirloom seeds originally saved by his uncle. Fresno chile peppers were first introduced in 1952 by seed company owner Clarence B. Hamlin. They were named after the county of Fresno, California where they were first grown. Fresno County sits in the middle of the San Joaquin Valley, which is the agricultural center of the state. As of early 2017, Orange Fresno chile peppers are mainly available through European seed companies. The origin of the orange variety is a bit of a mystery.